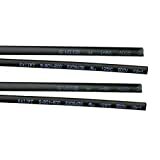 · Heat shrink tube made of self-extinguishing irradiated poleolefin. It allows to give a better finish to electrical connections and provides mechanical and anti-abrasive protection to cables and other electrical components. It is supplied in tube format of 1,5mts. of total length and presented in sealed plastic bag. Specifications Minimum shrinkage temperature: 90° C. Continuous working temperature: -55° C to + 125° C. Dielectric rigidity: 28,000 voltes/mm. Extension at breakage: 400%. Inner Diameter: 4mm Retraction Factor: 2:1 Wall thickness after shrinkage: 0.43 mm. Made of flame retardant flame retardant material. Colour: Black.